Eat baby carrots raw with dips and spreads, or enjoy their sweet flavor when cooked. No matter how you slice them, baby carrots are big on flavor. 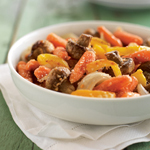 Here’s a zesty way to roast baby carrots and other produce with the pure taste of Kraft Salad Dressings, made with real ingredients and no artificial preservatives.